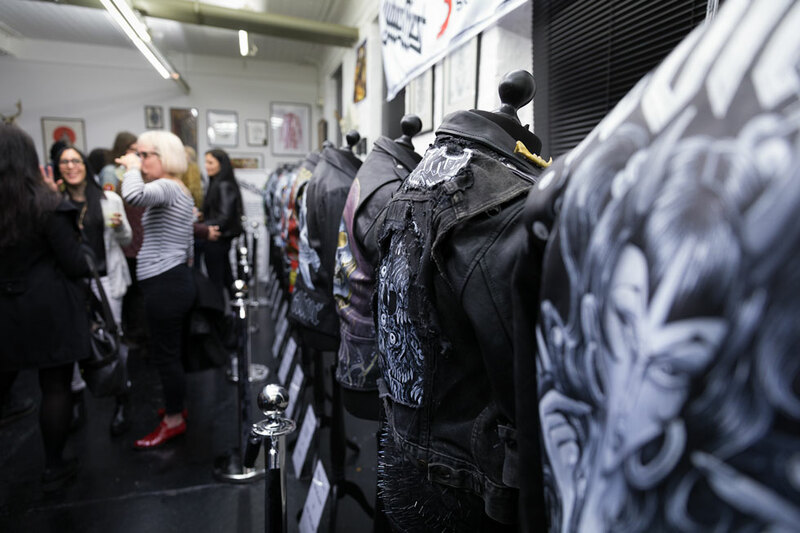 Parliament Tattoo Studio and Judas Priest joined forces to produce Hell Bent For Leather; an exhibition of hand-painted leather jackets from some of the biggest names in tattooing. Each jacket is inspired by albums and song titles from the hugely iconic metal band. With the likes of Xam, Uncle Allan, Wendy Pham, Scott Move, Jondix and Gregory Whitehead amongst the line-up of tattooers contributing, it’s easy to see why these biker jackets would garner such a huge amount of attention. 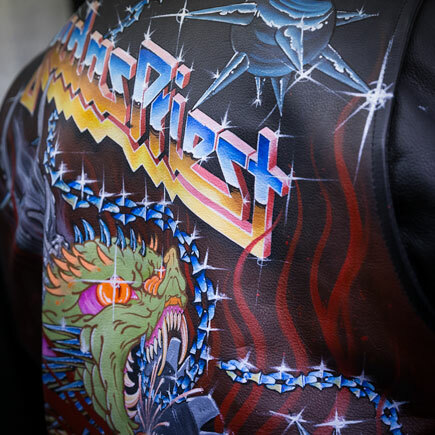 Each artist chose their favourite Judas Priest song or album title for their inspiration and applied the specially designed acrylic leather paint to the back of the jackets with painstakingly meticulous detail. We were privileged enough to receive an invite from Nicola Mary Wyatt of Parliament Tattoo to attend a private viewing of the jackets. Rob Halford was in attendance, as well as many contributing artists, Judas Priest inspired tattoos being done by resident artists and complimentary drinks. The tattoos were complimentary too, with a charity donation bucket next to the stations instead of paying the artists. The viewing really was something else and we put together a little video of the event. The one-off pieces will be on display to the public in London, at a free exhibition in the centre of Camden. An invitation-only event will launch the art event on 5th May in the Stables Market. You can get a chance to see the jackets here until the 10th, with the opportunity to purchase Judas Priest merchandise, music and more, with the proceeds going to charity. The jackets will then head to the prestigious Brighton Tattoo Convention on 13th and 14th May, where you’ll also find the Nine Mag team too! 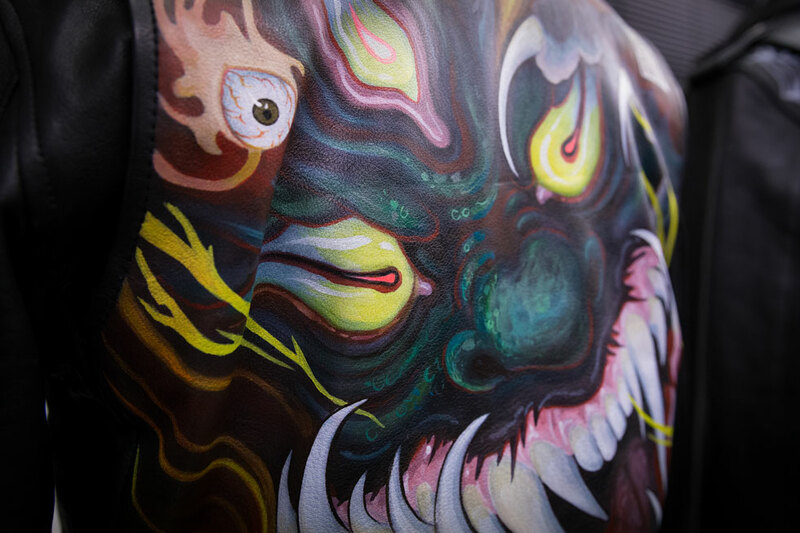 With more than 300 world class tattooists, including several artists from the Hell Bent for Leather exhibition, you’ll get another chance to see the jackets up close. Following the events, the jackets will be auctioned online, along with a signed certificate of authenticity from Judas Priest to benefit both the Ronnie James Dio Stand Up and Shout Cancer Fund and The Teenage Cancer Trust – both extremely worthy causes chosen by Judas Priest. The exhibition aims to raise as much money as possible to support the two charities.